OFFTIME. This Mobile App Effectively Staves Off Smartphone Distractions! 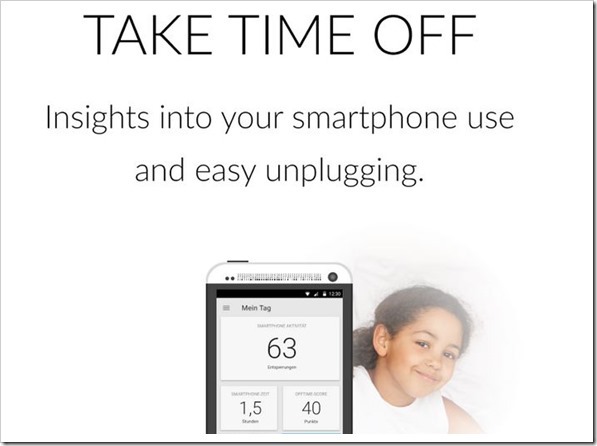 OFFTIME – This Mobile App Effectively Staves Off Smartphone Distractions! Smartphones are ruining our lives in more ways than one! Ruining them and running them too. So used are we to those tiny little (some not so tiny, alright!) monsters in our hands that it is difficult to imagine what life was like two decades back – when there were no cell phones around! Your kids will look at you with those you-guys-must-have-been-cavemen eyes if you tell them there was once life without cell phones. Though these wonderful devices were meant to make life easier and their users more productive, their misuse or overuse quite often has the opposite results. Smartphones do help you always stay connected and in touch, making sure you don’t miss out on important mails and messages. But that’s where the problem lies – you are ALWAYS connected! You often wish they weren’t around- so that you could focus on work, deliver better results and enjoy the few minutes off without those annoying notification sounds from your phone. I have seen dates getting ruined with phone-obsessed phubbing partners making their companions feel ignored, executives check their Facebook notifications going beep beep in the middle of important board meetings and students performing below par in exams because of distracting notification sounds from their games when it was time to study. Well, all those who have wished to be freed of such distractions without uninstalling some of their favorite and most used apps, here is an app to make things easier for you! Android users can make use of this wonderful free app called OFFTIME which will give you some minutes of silence and respite while still being connected to the internet. This amazing app allows users to create profiles that block calls, texts and notifications and much more. “You can even restrict access to any apps, so you can make sure you don’t get distracted and break free. Make exceptions for the people important to you, or send out custom auto-replies that let others know when you’re back on the grid. And you won’t miss a thing – check out the activity log for a comprehensive list of everything that happened while you were in your zone,” says the developer. The app which is still in the development phase and is only available for a preview at present. Meaning that one needs an invite to be able to use it, as of now. After downloading and installing the app, users will have to enter their email address and wait for their activation code before they can start using it. Most users say they got their codes within 36 hours. Entering the activation code gives users an access to all its features. Besides the usual features which most productivity apps promise like blocking calls, messages and muting notification sounds, it auto-replies to messages while also giving a detailed list of all the missed activities later. The most delightful feature about it is the extremely clean, clutter-free and user friendly user interface. Users have total control over apps or contacts they want to avoid for the chosen duration, complete with the option to auto-reply to their messages if they choose to. That means, you can choose to stay connected to your family and friends while auto-replying to any email messages from your boss or business clients while you are holidaying, without missing out on any messages. As you get used to the app, you will realize that though the internet didn’t cease to exist while you were away, it was good to take that much needed breather! The only downside of this app is that it asks users for too many permissions and though the developers say that those are absolutely required, users are not too happy about it. Have you used the Offtime already? If not, give it a try and let us know what you feel about it!